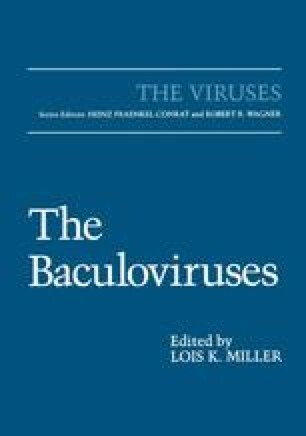 The Baculoviridae is a large family of occluded viruses that is composed of two genera that are differentiated by the size of their occlusion bodies. The nuclear polyhedrosis viruses (NPVs) produce large polyhedron-shaped structures called polyhedra, which contain many virions, while the granulosis viruses (GVs) have smaller occlusion bodies called granules, which normally contain a single virion. NPVs have been more extensively investigated than GVs, and therefore this chapter will mainly present information on NPVs. However, much of this information is likely to be pertinent to GVs because of the close relatedness of these two viral genera.